BUFFALO, NY (WBFO) – A professor at the University at Buffalo’s School of Dental Medicine recently traveled to Iraqi Kurdistan, where he and his partners built a clinic in just six days for people displaced by ISIS attacks. Dr. Othman Shibly is returning to that region later this month to serve thousands of young patients. Dr. Shibly, who’s clinical professor and Associate Director of the University at Buffalo’s Center for Dental Studies, was born in Syria. He returned last April 2018 to assist war refugees living along the border with Lebanon through the university’s Global Miles For Smiles program. Earlier this year, he traveled to Iraqi Kurdistan to visit a refugee camp established in Duhok. 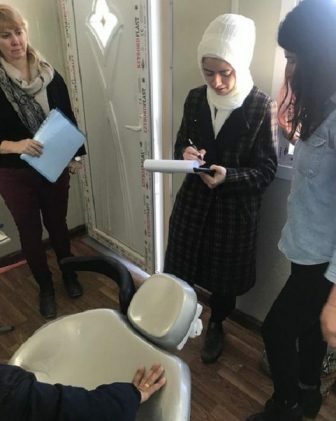 With the support of partners including UB, the Global Motherhood Initiative, University of Duhok College of Dentistry, Henry Schein Cares Foundation and the Syrian American Medical Society, he was able to construct a dental clinic to serve those refugees in just six days. That was made possible, Dr. Shibly explained, through grants and other material support from the partners. Dr. Shibly is returning to the region where, from March 31 to April 4, he hopes to provide dental care for an estimated 2,500 children at the Khanke Internally Displaced Population Camp. In addition to providing dental care, he explains a psychologist affiliated with the Syrian American Medical Society is traveling to the region to provide counseling to address the traumas experienced by refugees, including violence and capture and captivity by fighters affiliated with Islamic State. SAMS and partners have also provided support to help operate the new dental clinic on a regular basis, plus train those who will run it. An estimated 16,000 people are now living at the camp, mostly women and children, who became displaced five years ago when ISIS destroyed communities and attempted genocide. Dr. Shibly explains that Yezidis are among the oldest communities in the region, predating the introduction of Islam, Christianity and Judaism, and are a peaceful people.